You are here: Home / Giveaways / Contest Closed Babycakes Cake Pop Maker Giveaway! 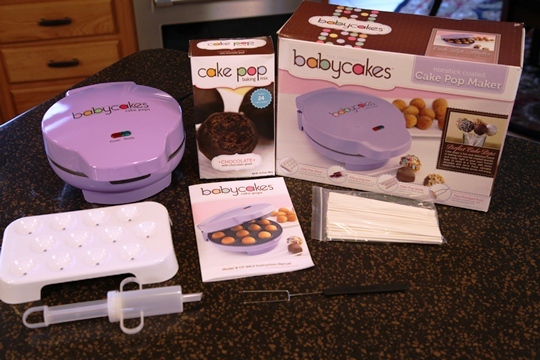 If I win the babycakes cake pop maker I will use it to make brownie bites, doughnuts, pancakes, cake pops, and everything else I can come up with!! I don’t have any kids, but I have a 14 year old brother and an almost 3 year old sister so I think this would be fun to do with the family when I visit my mom! I’ll probably have to make some panda pops at some point….. I am a baker at heart and I love to cook and make little things. I am however lacking tools and equipment as of late and I think this would be a very nice addition to my small but (finally) growing (again) collection. I have subscribed to your youtube channel, and was already subscribed to you blog, and I love reading it!!! If I win the Baby Cakes Pop Maker I would make brownie bits, lemon bites & would experiment with all ways it is used. It would be fun for my grandkids to use. Not sure how I would decorate them as I have never made cake pops. I am an avid follower of Make Life Special. Will subctibe to Youtube video as soon as I submit this entry. If I won I would make brownie bites, I love to make fudgey brownies, and a nice bite size treat of one would be so heavenly! I would love to give the maker to my sister! Our daughter would have so much fun with a Cake Pop Maker, I would get her all the decorations/supplies and let her make whatever she wanted. i don’t have kids or grandkids but everyone in my family has a sweet tooth — we are all kids at heart! 4. i would love to win this because i’m still new to baking and would love a quick easy way to make sweet treats! 6. i would decorate many ways. if a whole box of cake mix makes three sessions’ worth, then i’d decorate three ways. maybe sprinkles, vanilla icing, and chocolate? If I win this, I will make low fat/low sugar treats such as cake, brownies, quick bread and pancake pops. I recently read that you can also make savory things like veggie and turkey meatball pops, so I would try those also! I would love to make these with my grandkids, they love new and different things! I want to win this because it is a wonderful way to keep portion control in mind (just make enough mix for one batch) and save on utilities by not heating up the oven! I would decorate the sweet pops for myself with a sprinkling of stevia, lite cool whip and sugar free frosting and fillings. For others I would do sprinkles, powdered sugar and other fun things. I think for turkey meatballs bbq sauce or piped mashed taters would dress them up. We would definitely making some cool Star Wars and Avengers/Justice League cake pops, favorites in this house. I would experiment with making paleo doughnuts! I would make cake pops for my daughters daycare. I would do minnie and mickey mouse ones using mini oreos for ears. I would make cake pops for my son (and probably eat them all myself!) I would sprinkle crushed oreos after dipping them in chocolate. YUM! I subscribed on you tube and to the emails! i don’t have kids but i’d make these for parties and even just a sweet treat for myself! i’d make red velvet cupcakes and also egg&bacon bites for breakfast! i subscribed on youtube as kmcgrew213! i’d decorate the cake pops in icing and a coffee bean on top! i’d like to win because i’ve never made cake pops before! I would make brownie pops! I would like to win this so I can have some fun in the kitchen with my kids. We love to make treats together and we have not done baby pops yet.